- Use the 37 large keys to explore any of the 16 built-in sounds, including Grand Pianos, Guitars, Saxophones, Trumpets, Violins and much more. - The piano has 100 tones, 100 rhythms and animal sound effects, you can switch through the toggle key. - You can play any melody you wish, or teach yourself to play a song from the included music songbook. - The piano has 5 built-in songs that you can listen to or play along with. You can bring it anywhere!! 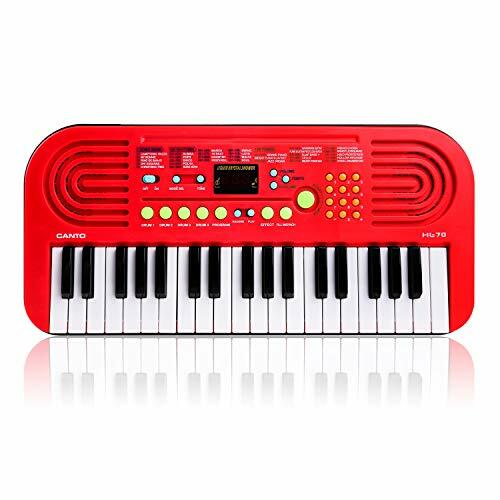 - Designed for little fingers, but with lots of features to keep the whole family entertained. - 2 power supply way for more convenient use, USB cable(include) plug in or used 4 AA batteries(not included). We are confident that we offer the best products and sales experience. If you are dissatisfied for any reason, please contact us, and we guarantee we will resolve the issue. Don't worry, we offer a 100%, 30-day money back guarantee!